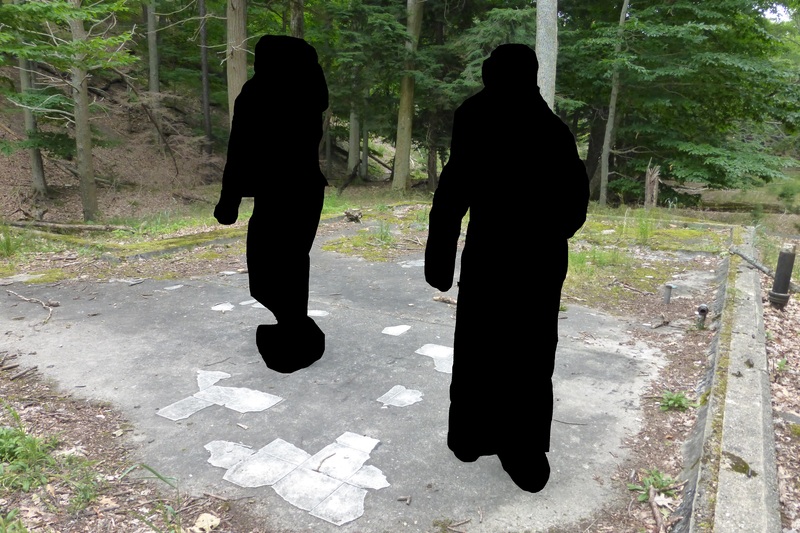 Here’s a question for you: what do you do when someone tells you about a 1950’s-era Scout camp, the remnants of which lie abandoned in an isolated woods within the confines of a popular state park? You go find it, of course! It was a cloudy day and a long trek to reach the location that was reportedly the site of a summer camp back in the post-WWII era. So take a visit to back when times were a little simpler and the forest was just a wee bit thinner. IF YOU VISITED this page before 11/10/15, it might benefit you to give it another read! Based on further information discovered, this article has been heavily edited. PLEASE NOTE: for the sake of privacy, the folks who accompanied me on this visit have been removed from the photos. As I am not photo shop-savvy, I have simply cut them out of the pics and filled in the area remaining with a solid color. 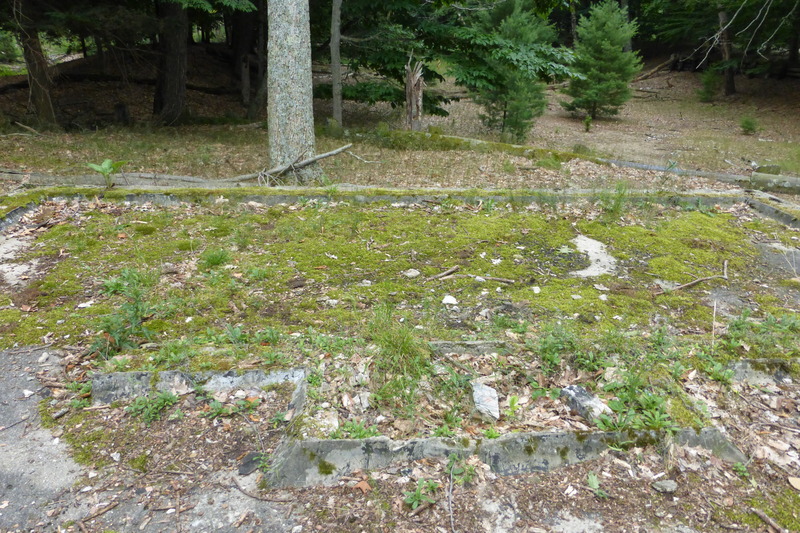 I apologize for the lack of aesthetics in this post, but do try to look past the glaring edits to see the beauty of nature reclaiming this old campground. 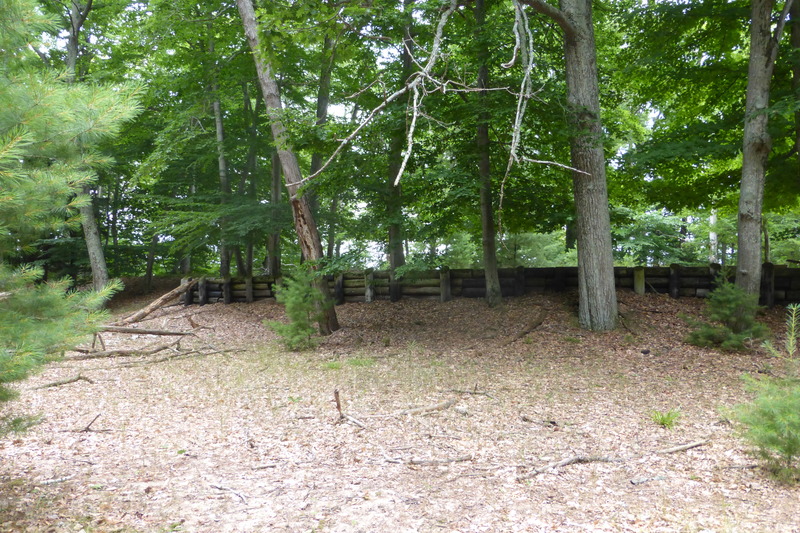 First view of the camp was from a sandy, central-feeling area that is surrounded on one side by a wooded embankment. Two sets of steps lie to the right and left. We took the steps to the right (to the right in the photo). View of the second set of steps from the sandy area. It was apparent from looking around that this area used to be completely cleared of all trees, except perhaps the big ones growing at the embankment’s edge. Walking into Bldg 1, which I now believe was once the recreational building / dining hall / kitchen / lodge. 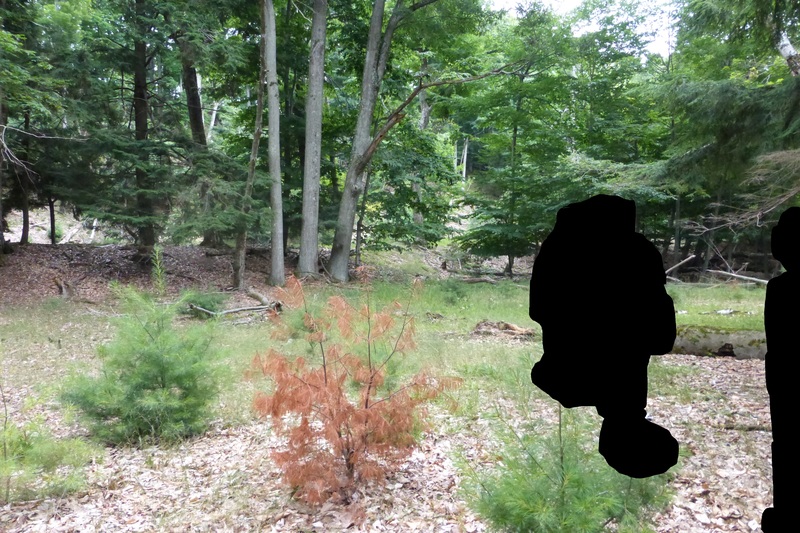 The area to the left reveals a fireplace. The area to the right appears to have been a kitchen with tiling still visible in the decaying floor. Standing in Bldg 1’s kitchen, with some of the tiling still visible. Piping is still visible around the walls of the foundation. Looking down the steps we had walked up into what was once a sandy clearing. Looking from Bldg 1 area over to the second set of steps. 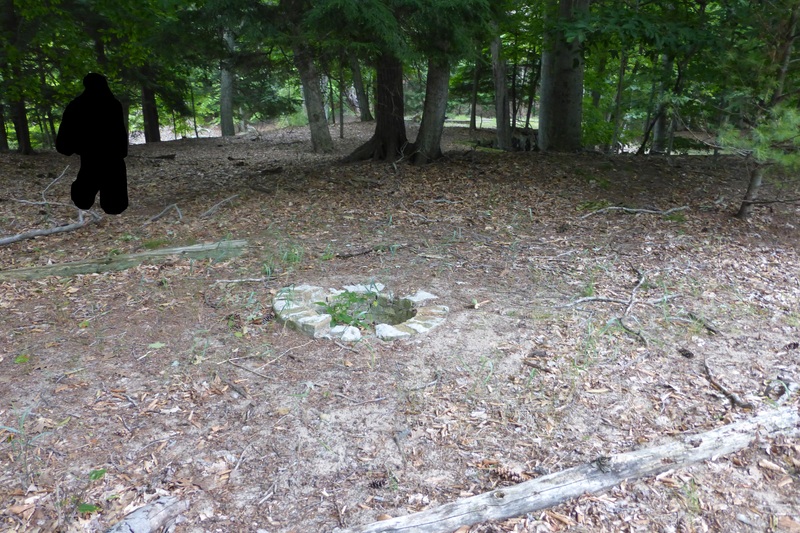 A possible firepit location as the trees were certainly not accidentally fallen in this configuration. Slightly west of Bldg 1, we stumbled across the ruins of Bldg 2. Bldg 2 appears to have been a long, rectangular building and does not appear to have any piping (unlike Bldg 1). 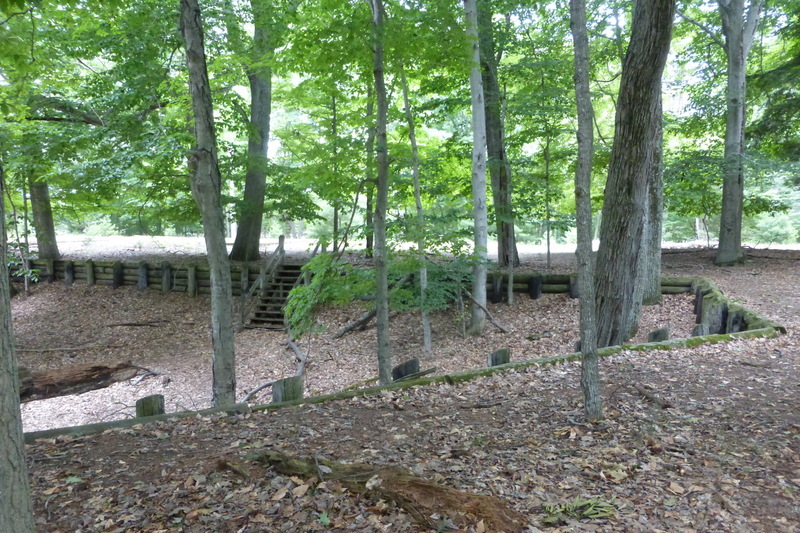 Bathhouse/laundry: north of Bldg 2, we came across what looks like a bathhouse with stalls, water hook-ups and a central drainage area still visible. 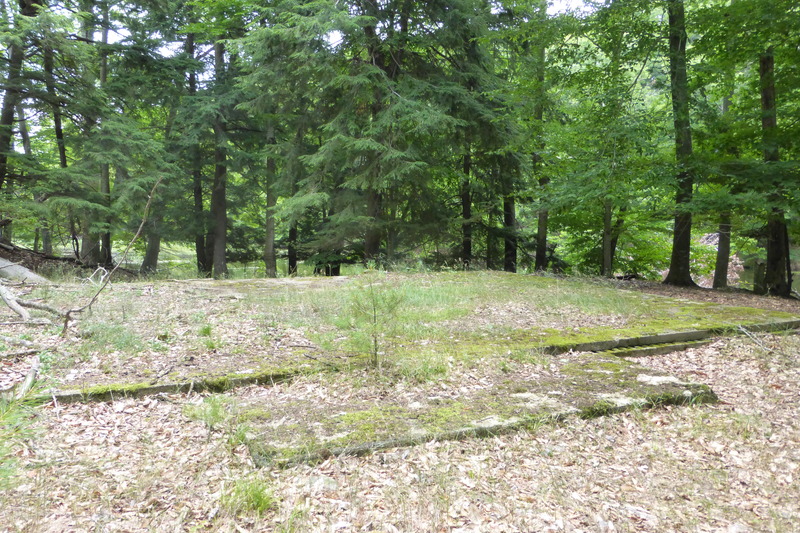 Bldg 3: Northeast of the the bathhouse lies another foundation in the woods, this one set back a bit from the main camp. Counselors’ quarters? The camp nurse? We can only offer guesses at this point. Closer photo of Bldg 3. 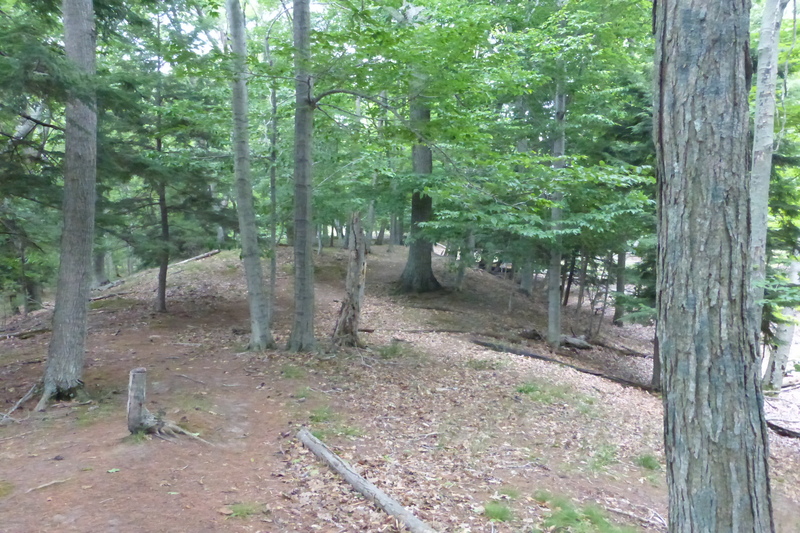 Walking down a faintly visible trail in the woods, we came to a point of land looking out at Hamlin Lake. It was then that one of my fellow explorers with a keen eye noticed old tin cans submerged under the water at the tip of the point and the remnants of an old dock, its boards and pilings still somewhat visible underwater. 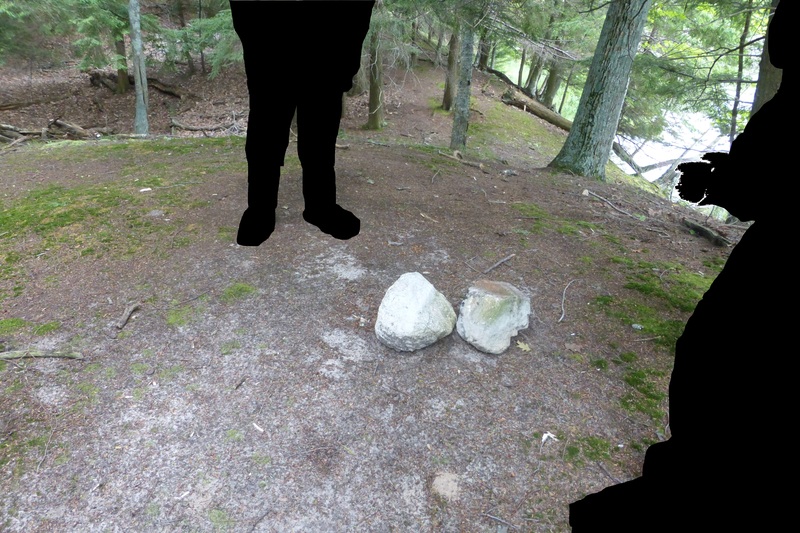 At the end of the point, we found a lot of large rocks like the ones above. 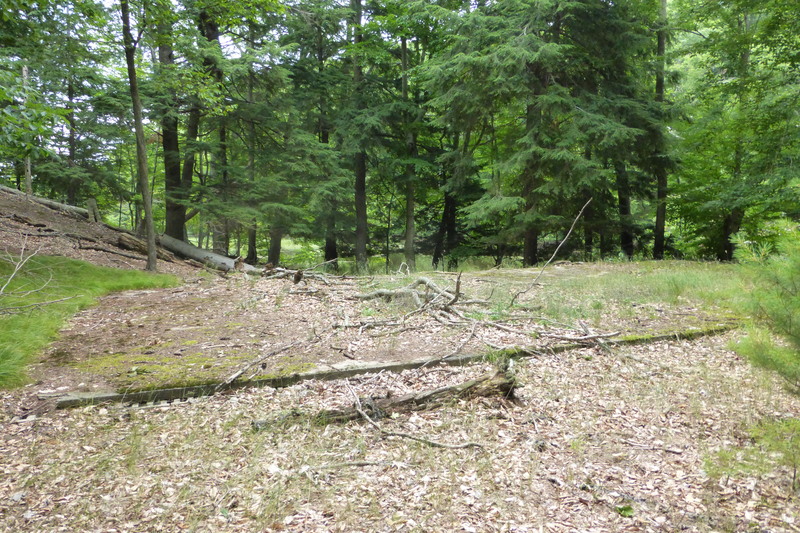 Charred areas of ground also suggest a possible remote campfire location. Back at camp between Bldg 1 and Bldg 2, we found this interesting piece of stonework. A campfire? No, alas–a well. Nay, two wells! The northern edge of Bldg 1, where a stone embankment separates the land from the lagoon water. Another view of Bldg 1, presumed to be the kitchen. Heading back into the sandy clearing. Walking the ledge trail back to Hamlin Lake. Ducking back to the sandy trail along Hamlin Lake, headed for the dam. 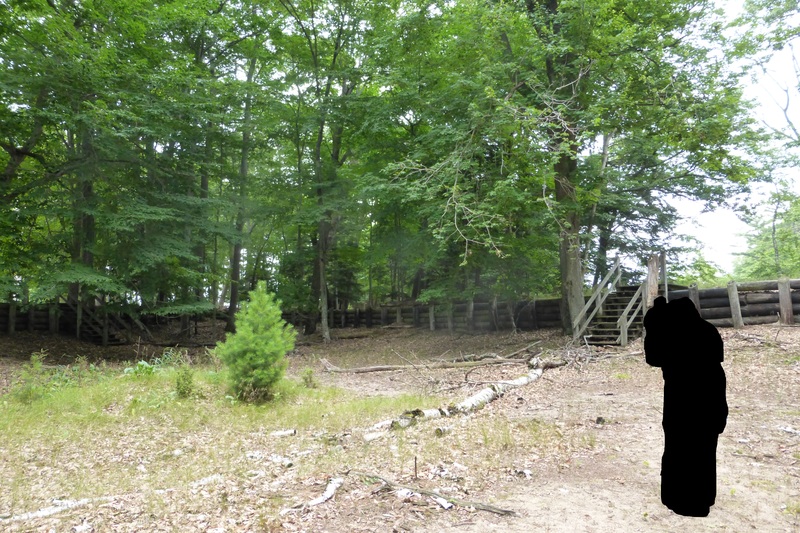 One of my presents to you–my artistic rendering of the general layout of Camp Lucy-Mac. Not to scale. 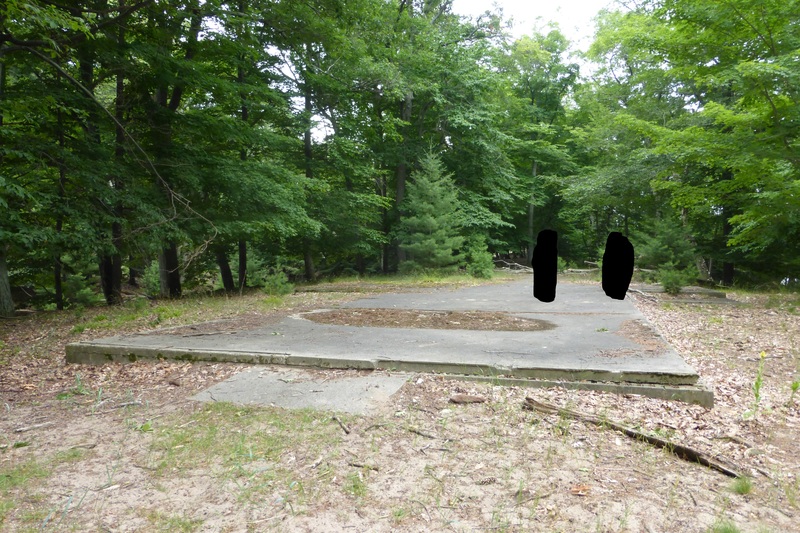 Bldg 1: Likely the recreational building / dining hall / kitchen / the Lodge. Bldg 3: Use unknown. Reportedly a classroom/sleeping quarters, but this is unconfirmed by newspaper. A Google Maps view of two possible sites where I believe Lucy-Mac was potentially located. 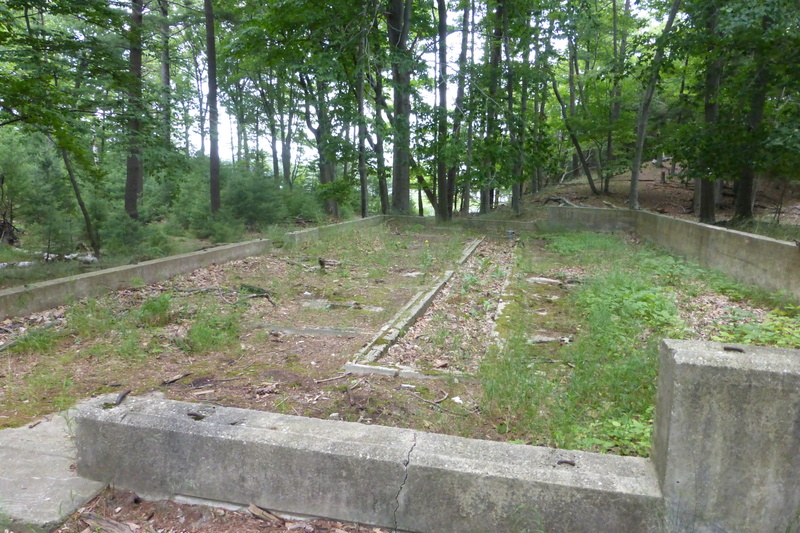 When Lucy Mac was in operation, a CCC camp stood in the Hamlin Beach area directly across from the Girl Scout camp peninsula. Hamlin Lake is an inland lake that connects to Lake Michigan via the Big Sable River. Note the dam in the photo above wasn’t always located where it stands today. As you might imagine, a find like this left me itching for answers. 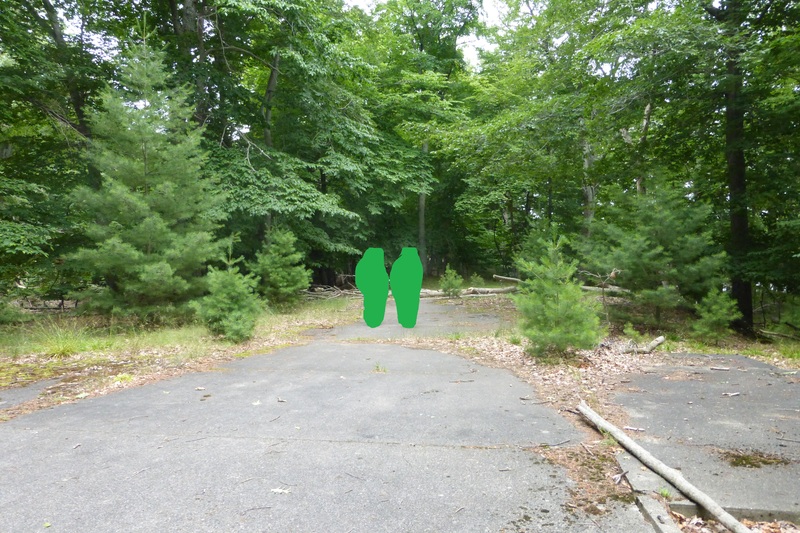 While my source knew the approximate location of the abandoned ruins of the above camp, my source wasn’t sure what years the camp operated, what it was called, or if it was a Boy Scout camp versus a Girl Scout camp. Upon returning home and to internet coverage, I began my search immediately. Surprisingly, information about this particular location was hardly forthcoming. Several hours of searching left me thinking I’d never get to the bottom of this one until a name popped up in an old newspaper clipping from 1941: Camp Lucy-Mac. Upon reading the article, I realized I had found what I was looking for. I found yet another newspaper article, this one from 1944, which gave me the lowdown of this little-known campground. 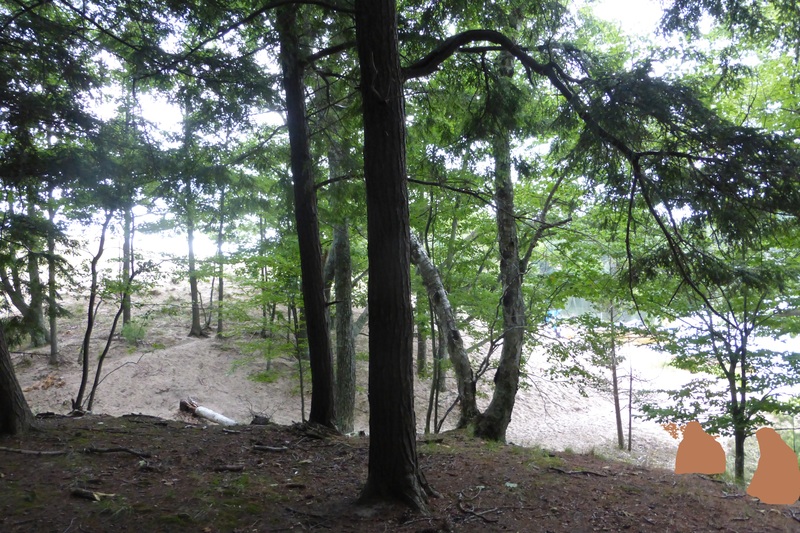 Back in 1932, the Girl Scouts (GS) took over a Boy Scout camp at Canfield Lake, which is just north of Ludington near a town called Manistee. It was renamed Camp Michawa. 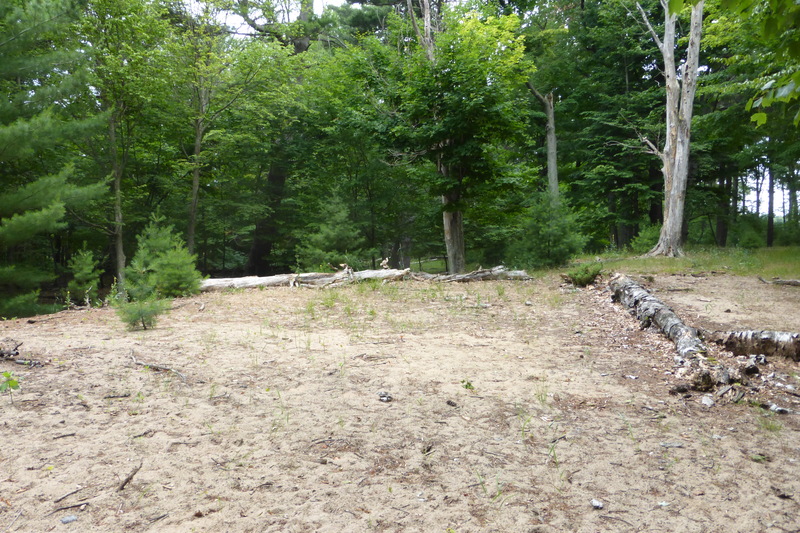 This worked out well for a few years until this small inland lake dried up to the point where it no longer supported water activities, and the GS folks moved across the lake to Wisconsin to Camp Sinawa in 1936. But the Michigan GS troops wouldn’t find themselves traveling across Lake Michigan to attend camp for long. 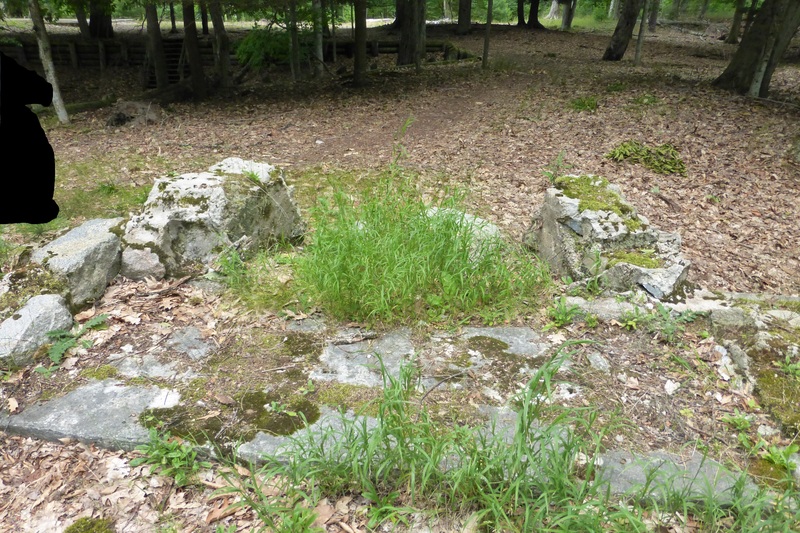 In the early months of 1937, a lady named Lucy McCarthy was watching her efforts to create a GS camp in Ludington State Park (LSP) take root. Having organized the meetings between the Michigan Conservation representatives and the GS leaders, the site for a GS camp within LSP was approved on a 6-degree March day. From that point on, construction and reorganization began. Mrs. McCarthy organized local men from Ludington to come out and cut down trees, clear out poison ivy, and make the area generally inhabitable for excited Girl Scouts and their counselors. She also orchestrated the transfer of items from Camps Sinawa and Michawa to the new site, bringing over everything from tents to tent floors to latrines and an outdoor stove to Lucy-Mac via Lake Michigan. 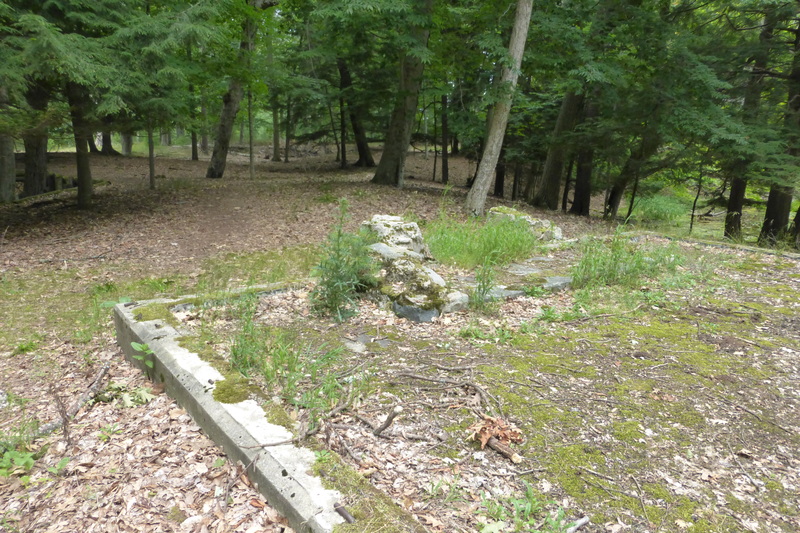 On July 11, 1937, Camp Lucy-Mac opened and was named in honor of the lady who had worked so hard to start it. According to the Ludington Daily News, Mrs. Jennie Lind was the director, and the camp, though humble, was off to an auspicious start. By way of activities, Lucy-Mac boasted outdoor cooking classes, swimming, boating, hiking, overnight trips, handicraft, and an opportunity to work on scout badges. That isn’t to say the budding camp wasn’t without its problems. In its first year, there were no permanent buildings–only tents. The Girl Scouts who attended that year named the main dining tent “the sieve” due to the amount of water that poured in through its holey roof during rain showers. The outdoor stove was the only location where food could be cooked in the entire camp, and so all food was cooked outdoors–rain or shine. 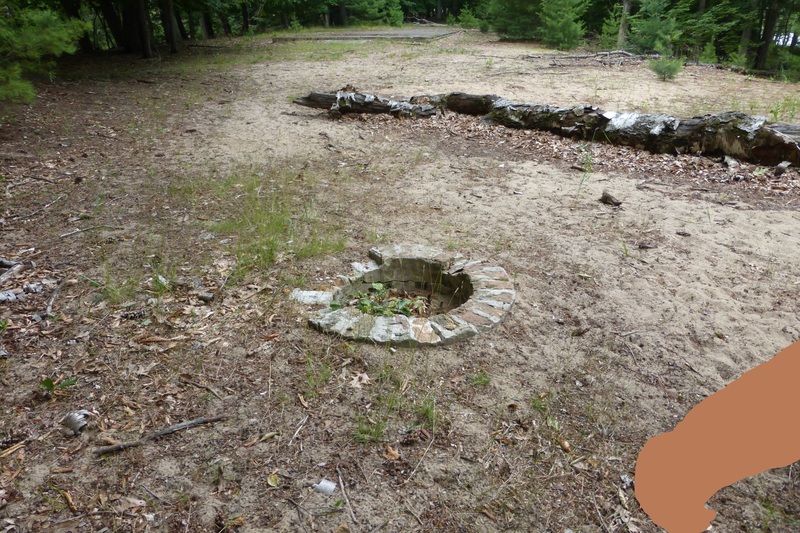 The wells that were sunk on the day that the camp opened were soon shown to have bad water, so all water was brought to Lucy-Mac from the CCC Ludington-Pere Marquette camp from across Hamlin Lake in large milk cans. To boot, it seems that the men Mrs. McCarthy had recruited to pull poison ivy were not as thorough as they ought to have been as the paper reports that this first year, most of the staff got poison ivy so badly that nearly each of them had to go home at some point to recover. In later years, permanent buildings would be added, starting in 1938 with a screened-in kitchen. The outdoor stove became an incinerator and a convenient location to make popcorn at night. 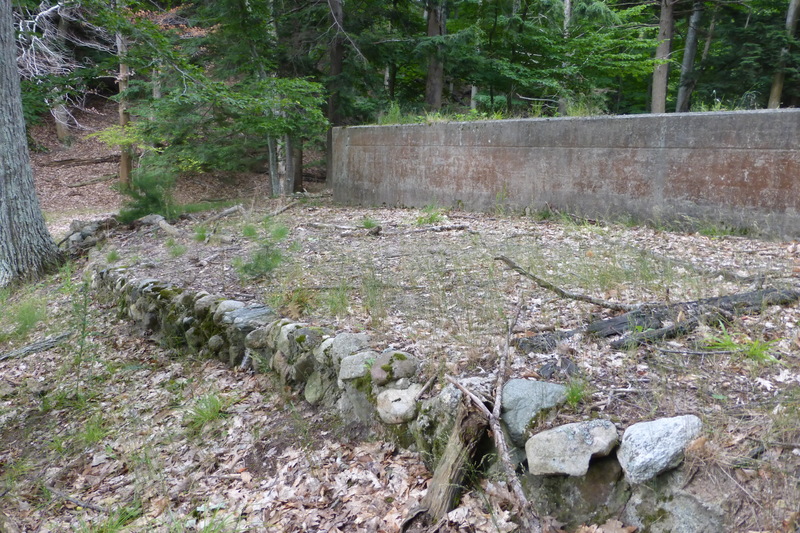 By 1941, the State Park would add a bathhouse, laundry, a lodge, and recreation building. 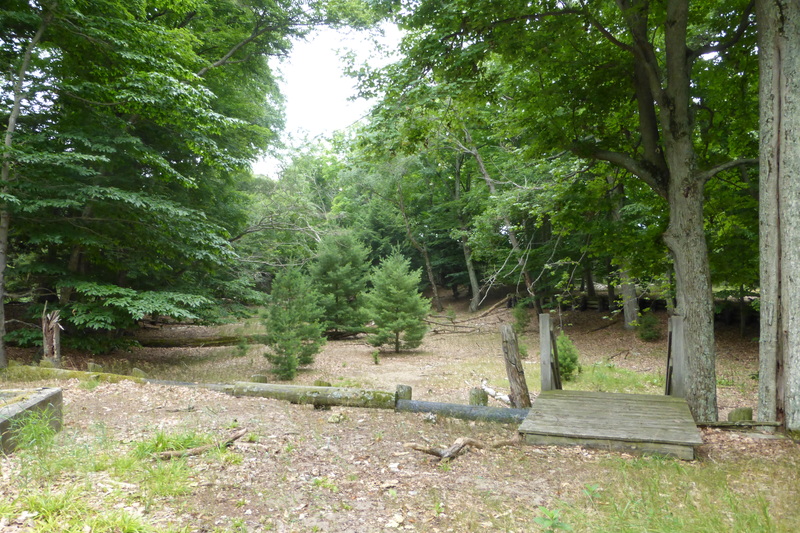 Behind (south of) the lodge, there was the sandy playground–surely the clearing we came upon on the way to the camp–which was used for making tin can breakfasts, playing baseball, and hosting nightly campfires and evening dramas put on by the campers. The girls’ tents were set up around the lodge and swimming area. 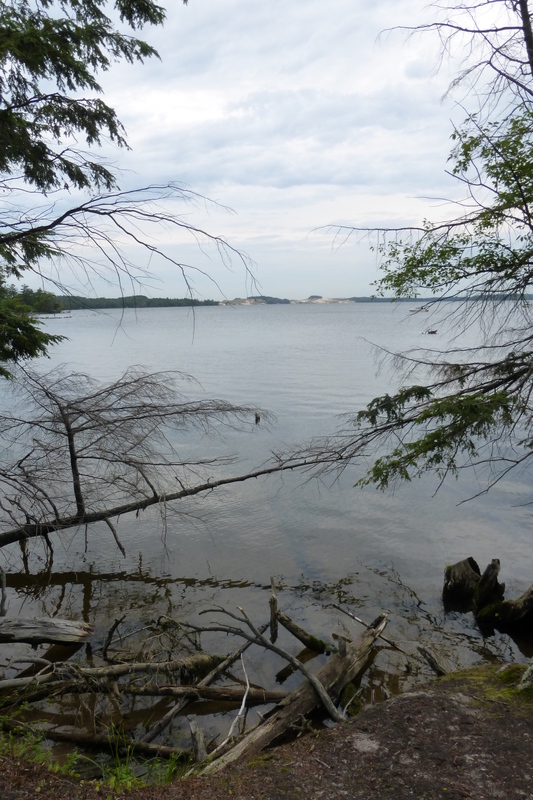 And finally, Pirate Island, which was just north of Lucy-Mac, was nearby enough to host camp-outs and tin can cookouts (remember those tin cans one of my companions had noticed in the water?). 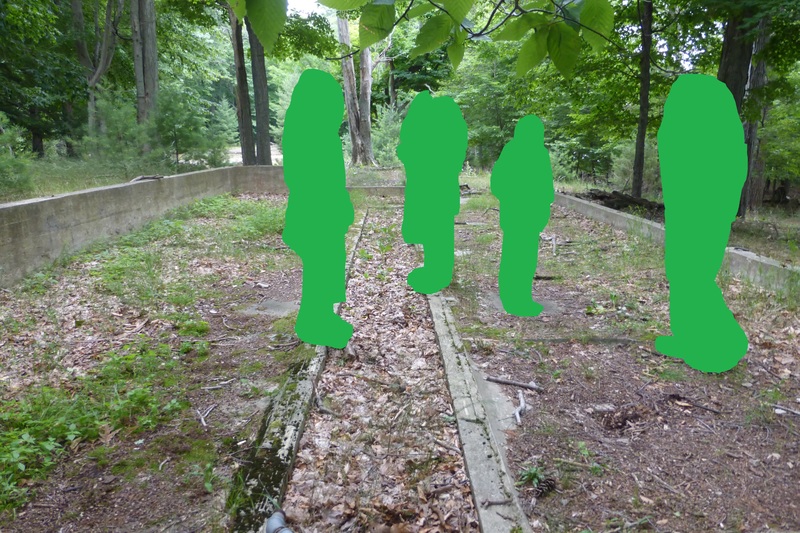 While I was able to discover its opening date, I have not yet discovered when or why Camp Lucy-Mac was closed or what led to it being demolished to its foundations. 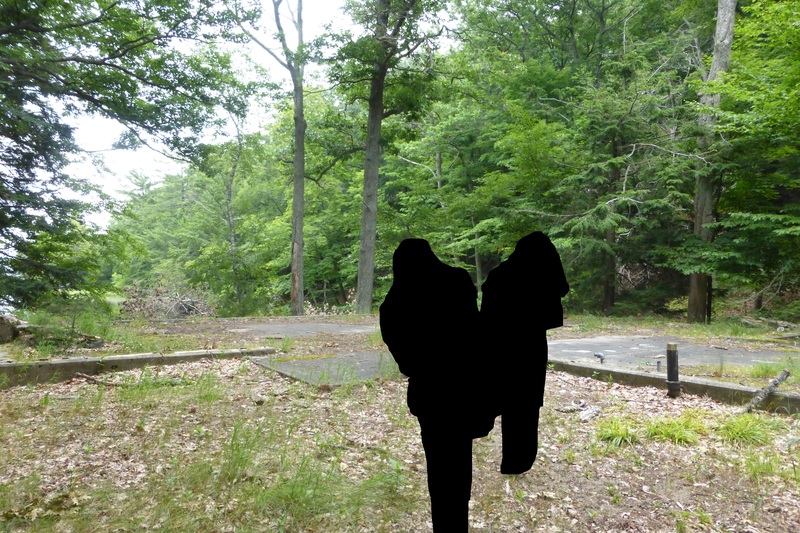 If any of you happen to know the history behind this curious camp, please leave a comment below!